I know I’ve been talking about making this for almost a month now, but I finally just got around to it. What can I say, it’s been a busy month! 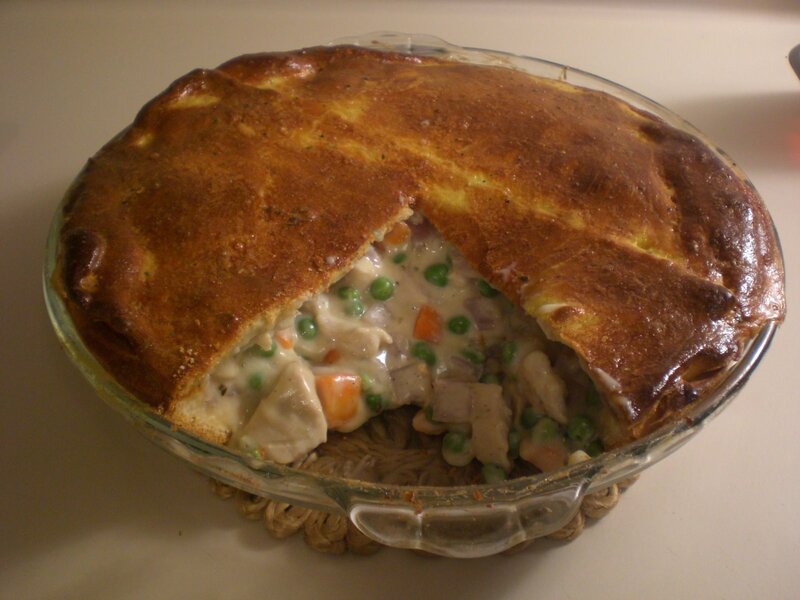 This was my first attempt at pot pie, so while it turned out well, I think I would go for more veggies next time. Smaller quantities of each with more variety. Heat oven to 375. Grease 9 in pie plate. Take about 2/3 of the first can of crescents and pinch seams together. Spread in pie pan. This won’t fit perfectly, just kind of smoosh it in there til it’s pretty close to covering the bottom and sides. Cut off any extra dough. Place in the oven for about 10-15 min, until it’s golden brown. Remove and set aside. While bottom crust is baking: In a large skillet heat the olive oil. Add the chicken and cook until the outsides are white. Add the onion and carrots and cook for about 5 more minutes. Remove from heat and stir in the peas. Mix sour cream, gravy, cornstarch and seasoning in a bowl with a fork or whisk until well blended. Stir this mixture into the chicken/vegetable mix. Spoon this mix into the baked bottom crust. Take the remaining dough from the first can and about 1/2 of the second can of crescents. Pinch seams together and place over the top of the pie. Again, it’s not going to be a perfect fit. Just cut off extra dough on the sides. Bake for about 20 min. Brush with beaten egg, and cover edges of pie with strips of foil if they are getting over dark. Bake for about 15 min more, until crust is golden brown. Many of my other Christmas gifts are still in their boxes waiting to move to the new house. But I decided I couldn’t wait for the move to open this one and give it a home on my counter. It is Fabulous! And while I don’t mind just looking at it, I thought Scott deserved a little thank you treat. I have made the first batch of Chocolate Chip cookies and they turned out great! The holiday season always makes me feel like baking. I have a few favorites that I make every year, but I’m always looking for new ones too. Here’s a recipe I thought I’d try. Heat oven to 375. Beat shortening, peanut butter, brown sugar, milk and vanilla until well blended. Add egg and beat until just blended. Combine flour, baking soda and salt and gradually beat into peanut butter mixture. Stir in 1 cup toffee bits. Drop by teaspoonfuls onto ungreased cookie sheet, top each with reserved toffee bits. Bake 7-8 minutes or until set.